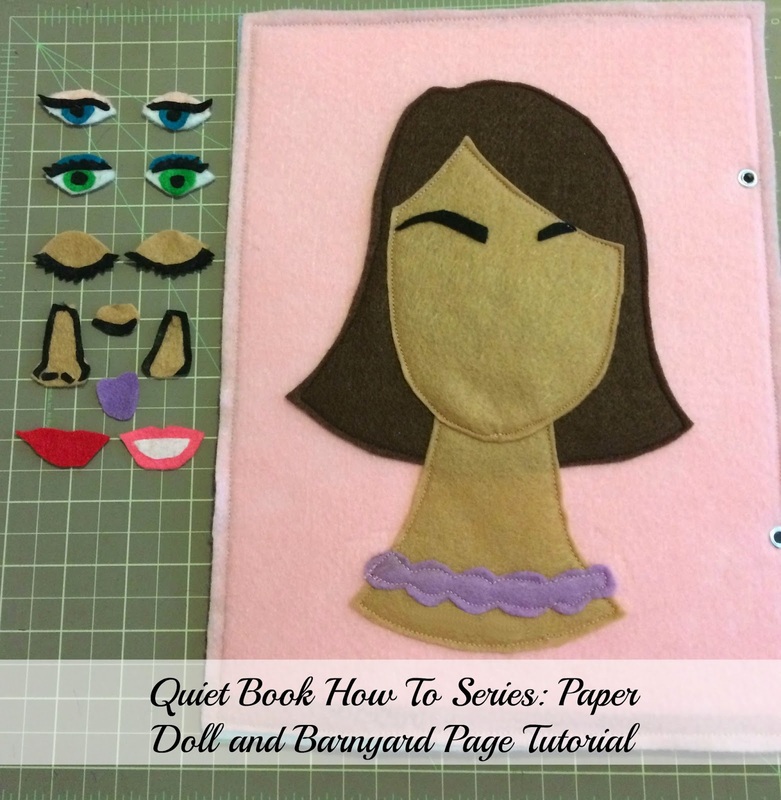 This is the sixth part of the Quiet Book How To Series. You can check out my posts below to make my previous pages. From now on we will be making two pages, a front and back. The front is part 2 of the Barnyard Page. The back page is part 1 of the Doll Face Page. Cut a piece of green felt that is 2" by 9". 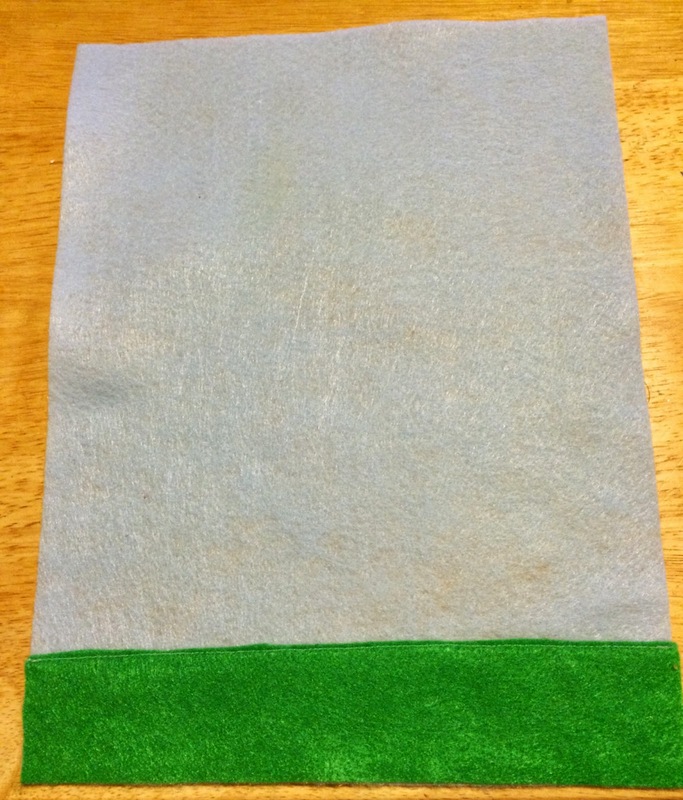 Place on top of light blue felt sheet and line up to the bottom and sides of sheet. Sew the top of the green felt to the light blue felt. 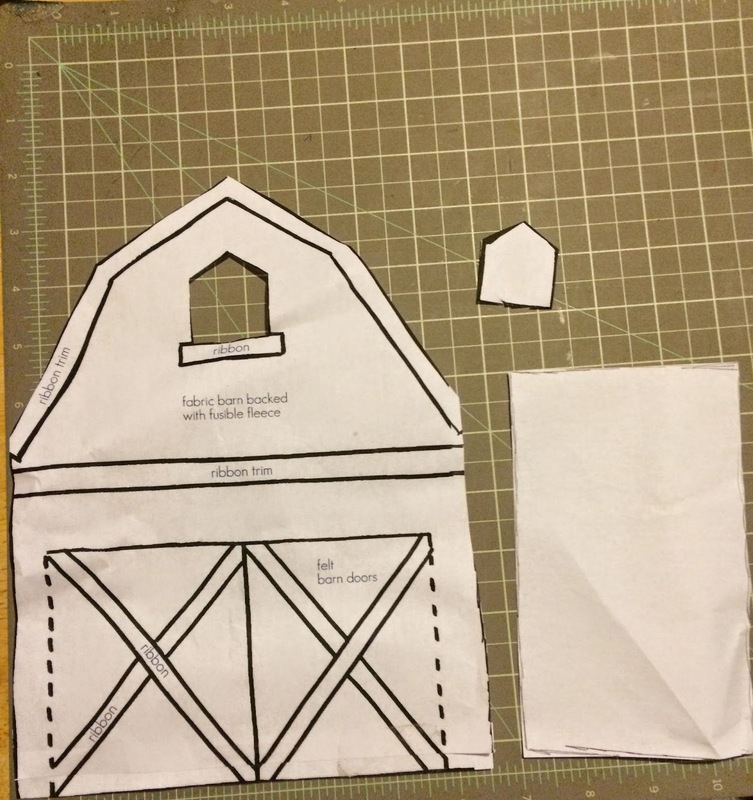 Print out and cut out the barn template. Cut out the little window on the top and save. Trace the white trimming of the barn onto the paper side of the fusible web. Iron onto white felt and cut out each piece. 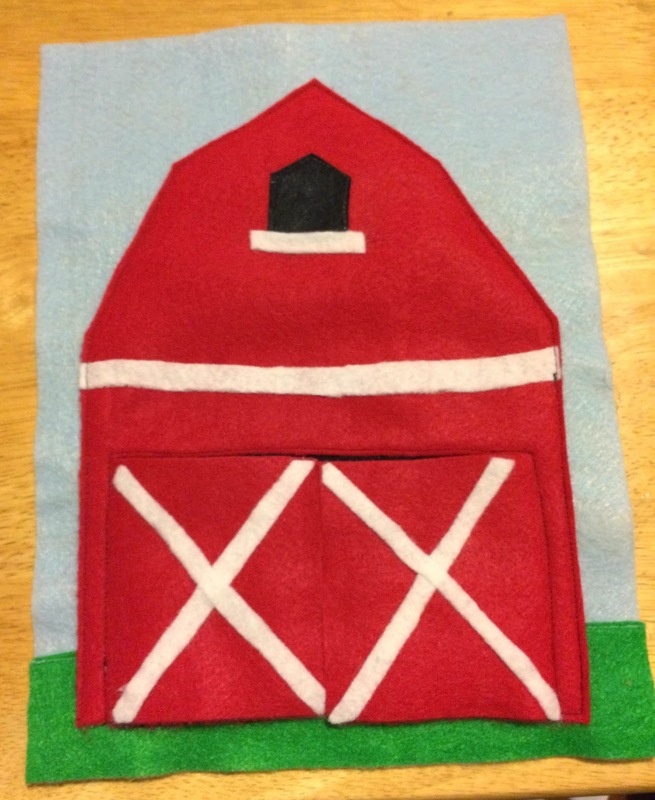 Place barn template on top of red felt, pin and cut out. Cut the barn doors open. 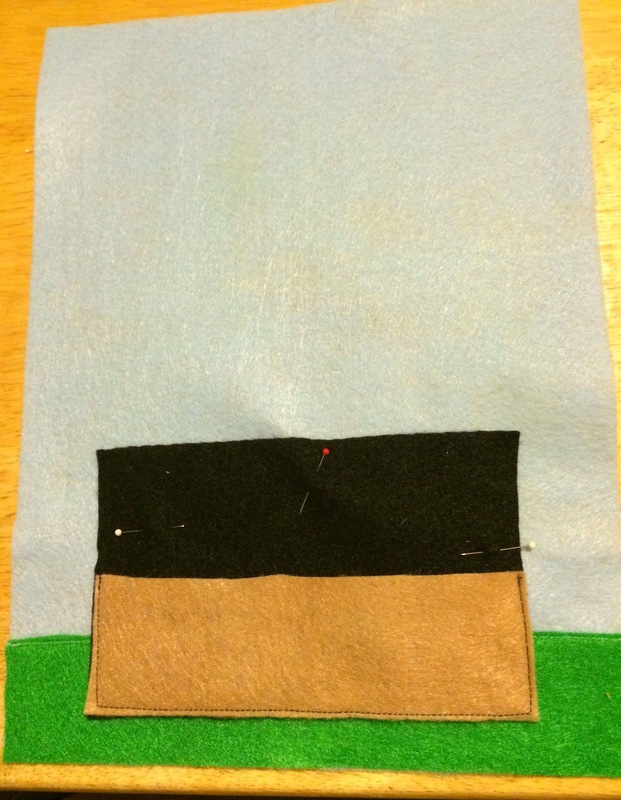 Using the window template you saved trace onto a piece of fusible web and iron on to black felt. Remove paper backing and iron onto barn. Cut a piece of black felt the same size as the double doors of the barn. 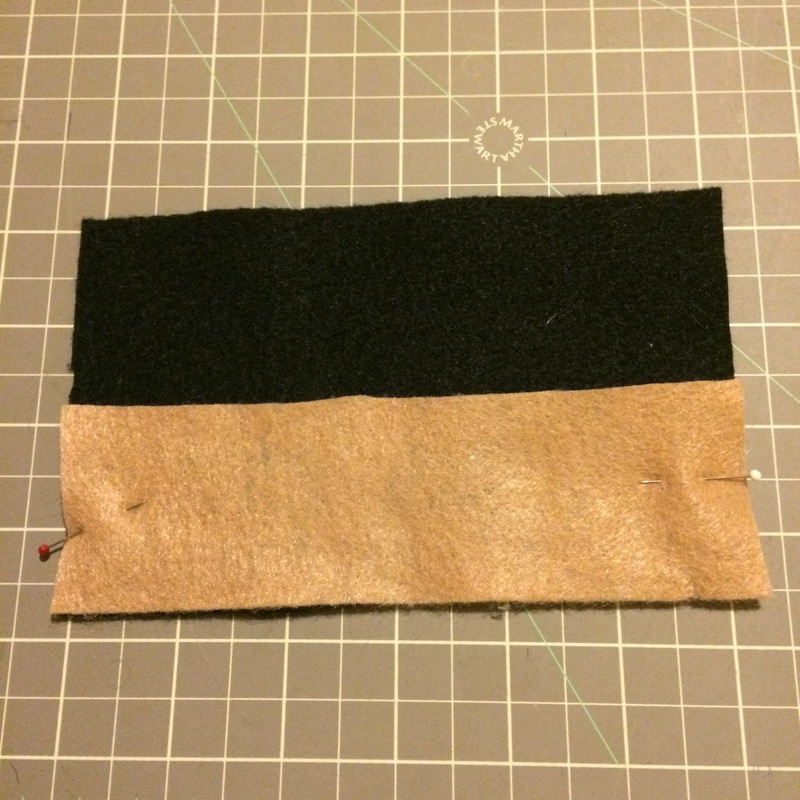 Cut a piece of tan felt into a rectangle that is the same width and half the height of the black felt. 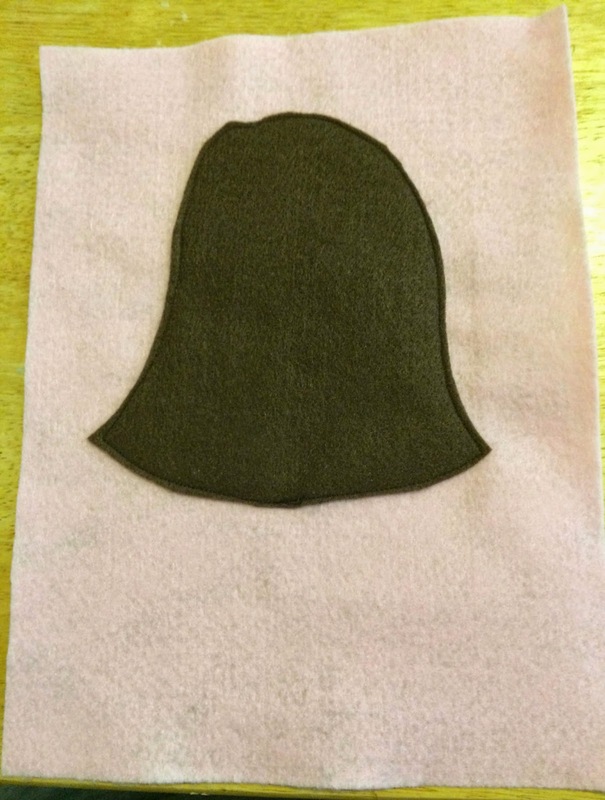 Place tan felt on top of black felt and line up to the bottom and sides of black felt. Sew the sides and bottom of the tan felt to create a pocket. Place red barn on top of light blue page where you want it to be. Open the doors and place the black and tan felt pocket inside. 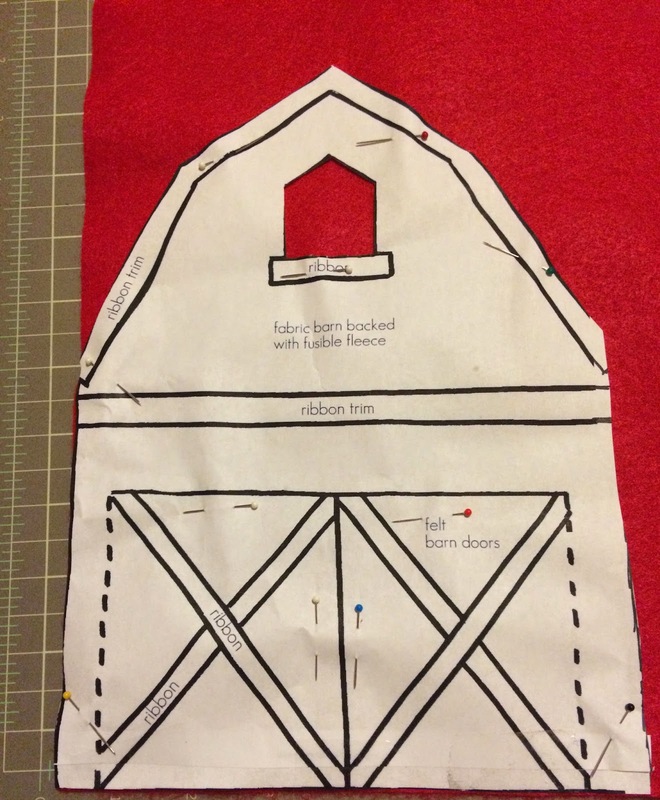 Pin the pocket in place, remove the barn and sew all around. Place barn on top of pocket. The doors should be right on top of the pocket. Pin and place and sew the sides and top of the felt onto the light blue sheet. Sew the sides and top of the door. Remove paper backing from white barn trimmings and iron into place. 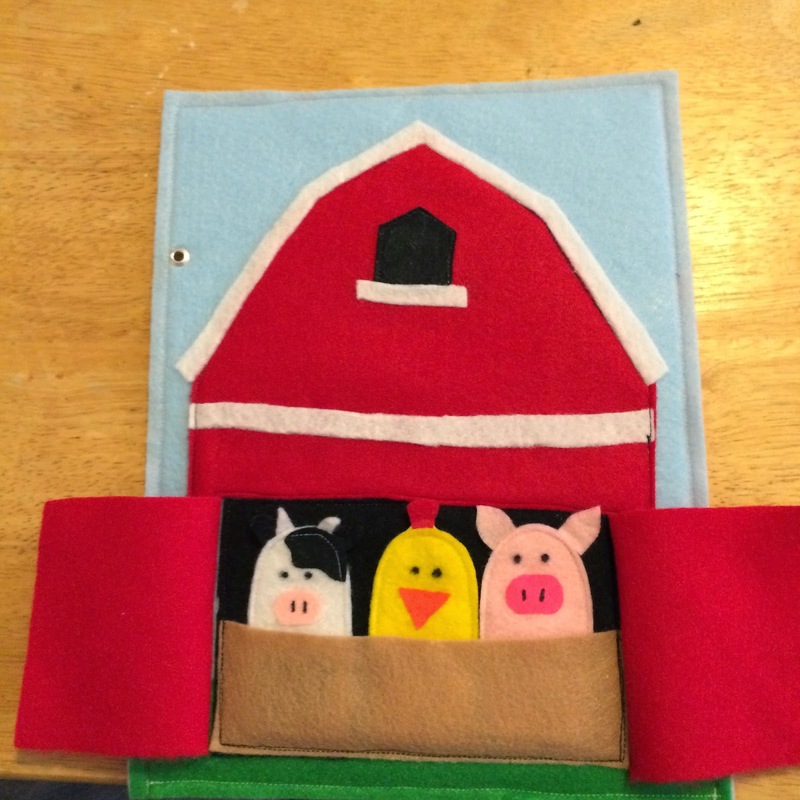 Place the animal finger puppets you created from the previous page into the pocket. 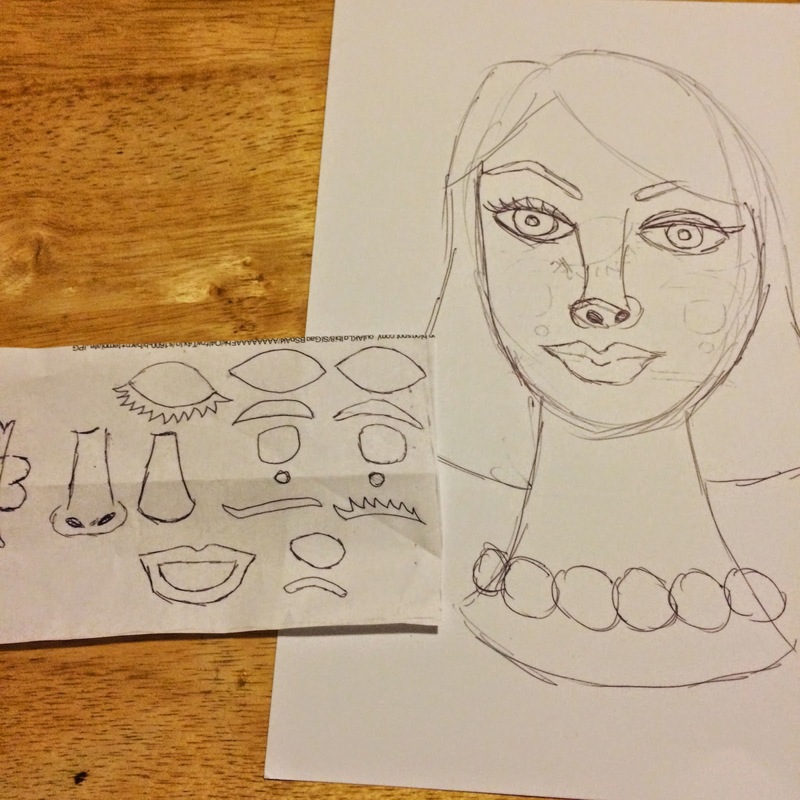 Draw a picture of a face, neck and hair. 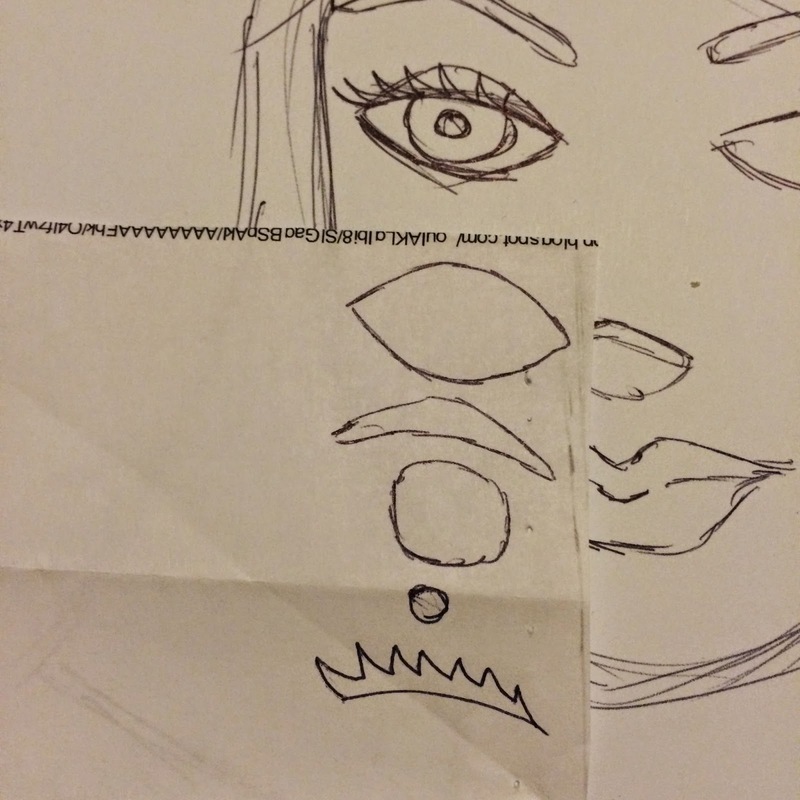 Using the face as a guide for size draw three different sets of eyes, nose and lips. When drawing the eyes draw out each part of it like the lid, pupil, etc. 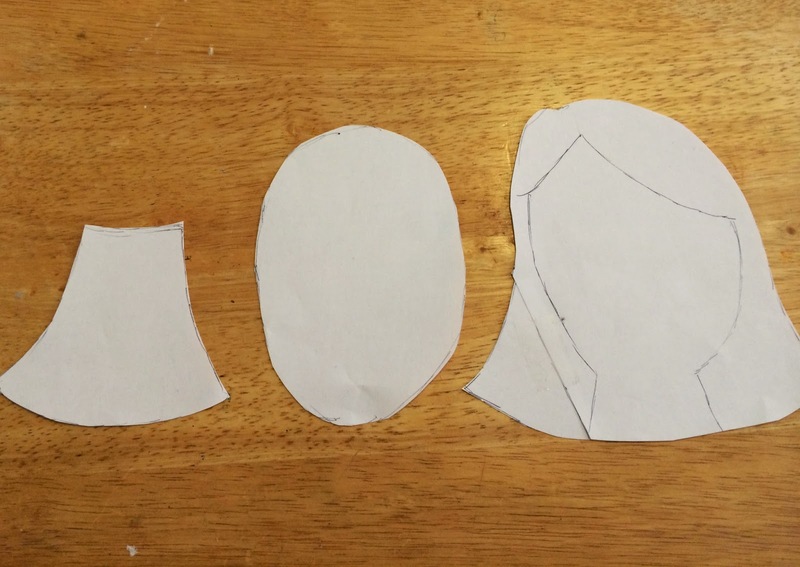 Cut out the head, neck and hair separately. Pin the neck and head to skin color felt and cut out. Pin hair to hair colored felt and cut out. 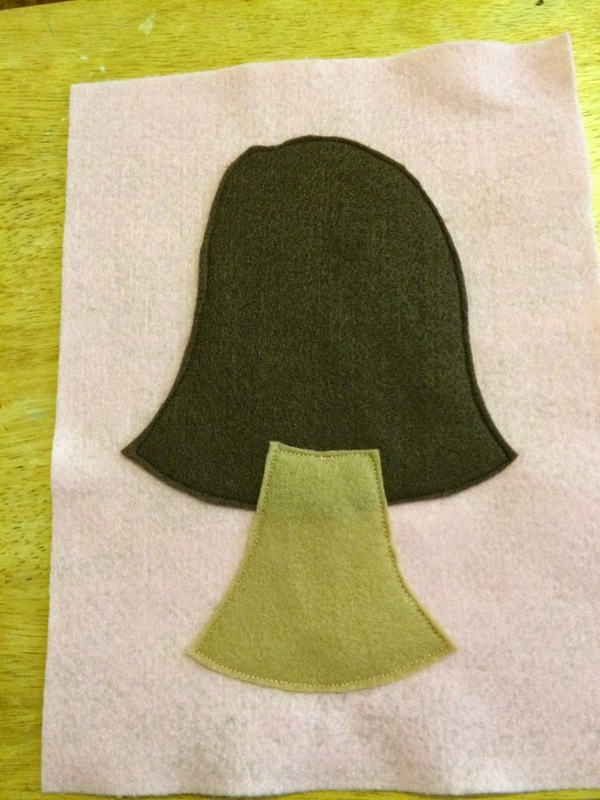 Assemble hair, head and neck on top of pink felt when you want the finished product. Remove the head and neck. Pin the hair in place and sew all around. Pin the neck in place and on top of hair and sew all around. 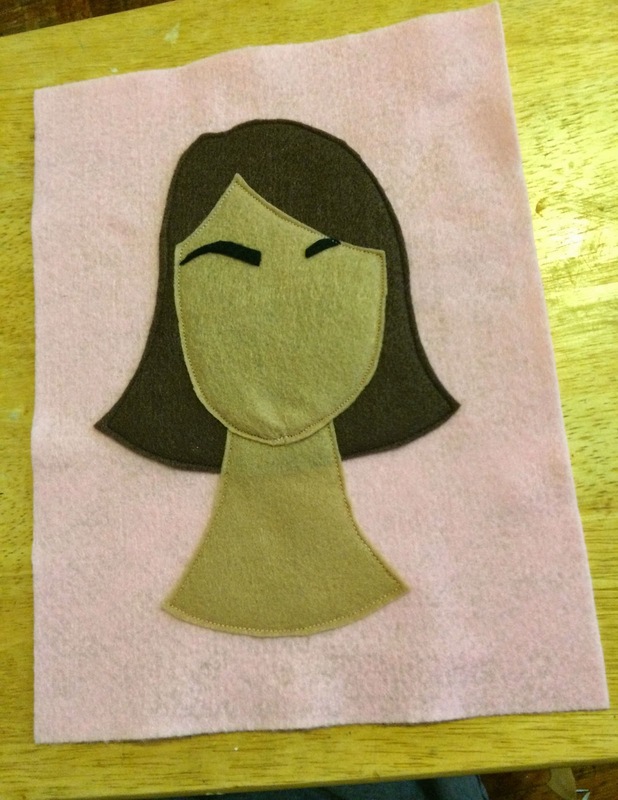 Pin the face in place and sew all around. Trace the details of the face features like the eyebrows, lids, pupils, lashes, teeth, etc. onto a piece of fusible web. Iron onto respective colors. Iron on details to their features. Iron on eyebrows onto the face. Take the two completed pages and sandwich them together. The barnyard page should be on top and the doll face page behind. Stitch a 1/4" seam around 3 sides of the two pages of felt. 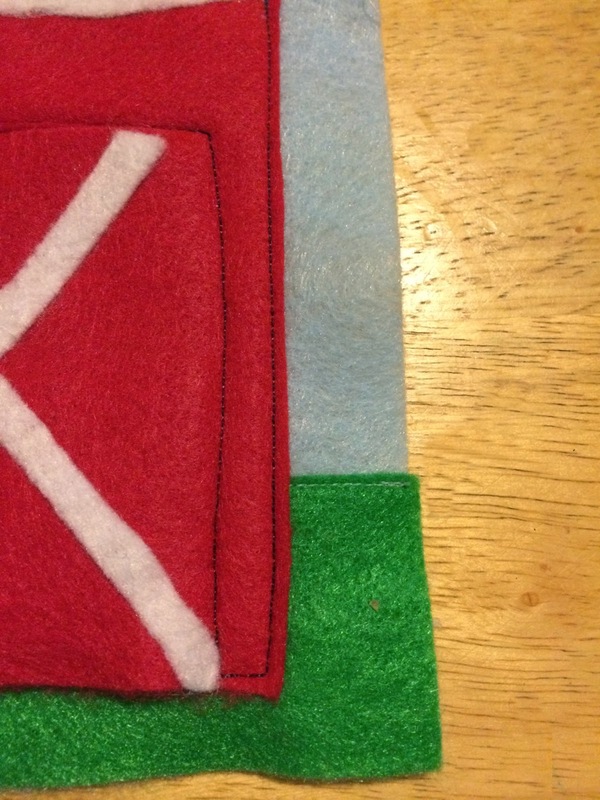 Slip all of the card stock sheets into the opening of the felt pages you just sewed. Sew the opening shut. 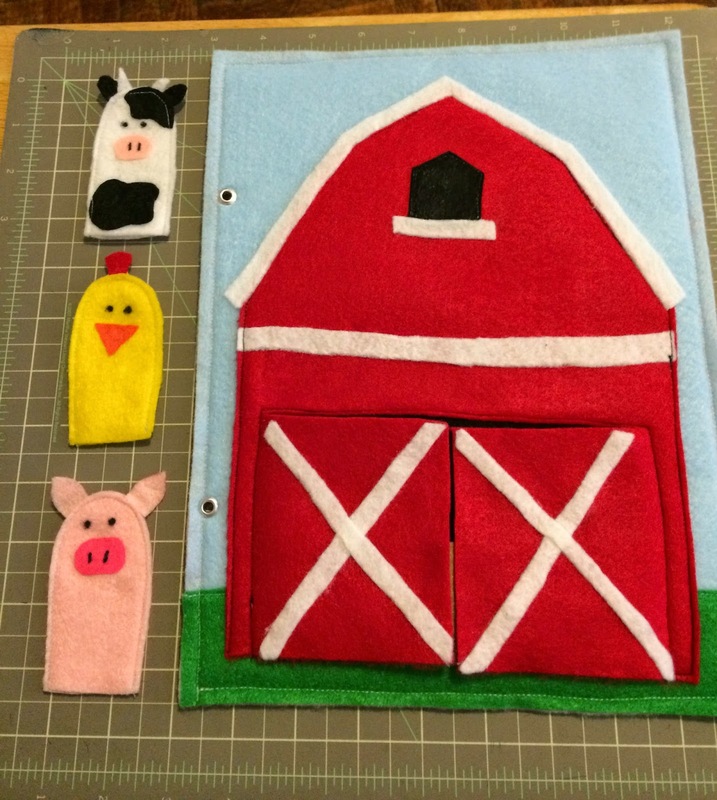 Place grommets 3 inches down from top and bottom on the left side with the barnyard page facing up. Attach to the rest of the pages using the rings. 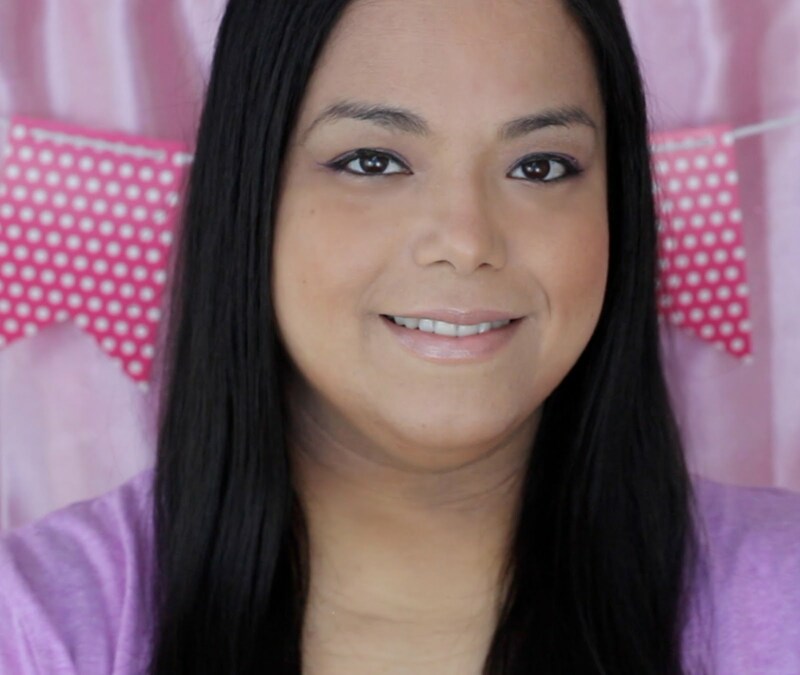 ** Stay tuned for my next tutorial where I will be making part two of the doll face page and part one of the face page. That is such a great book idea. It seems easy to make too. This is super cute! I bet my daughter would love this! How adorable! 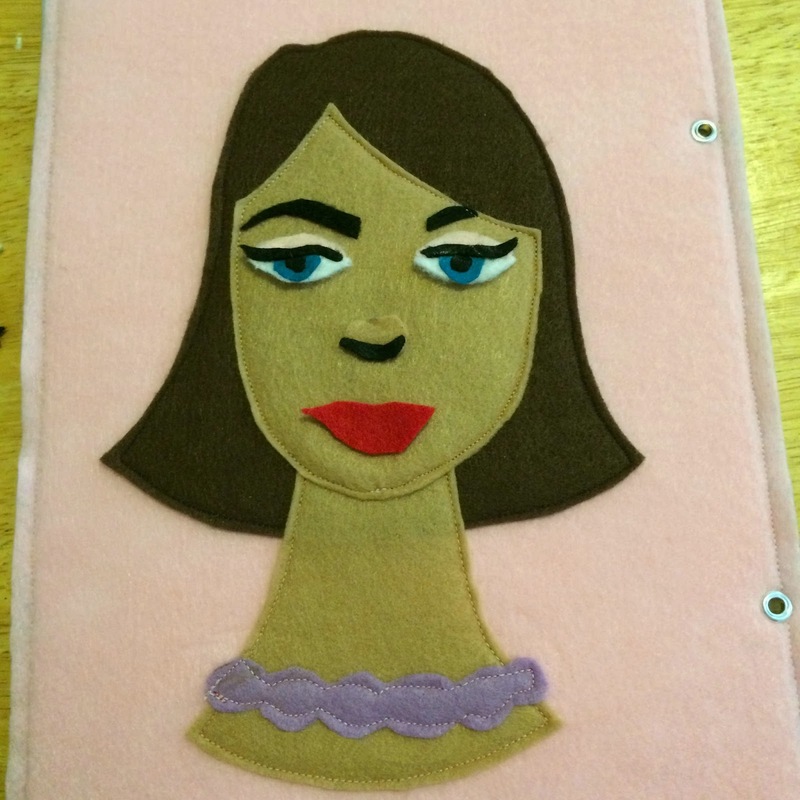 We have a local WAHM who does beautiful felt storyboard sets... seeing these things and her creations has me thinking that it's time to place an order. I LOVE these! There are several young toddlers in my family (seems like everyone of us cousins had babies all at once). I am going to make up a bunch of these for our reunion next month. Thank you so much for sharing these!!! I love the barn page! 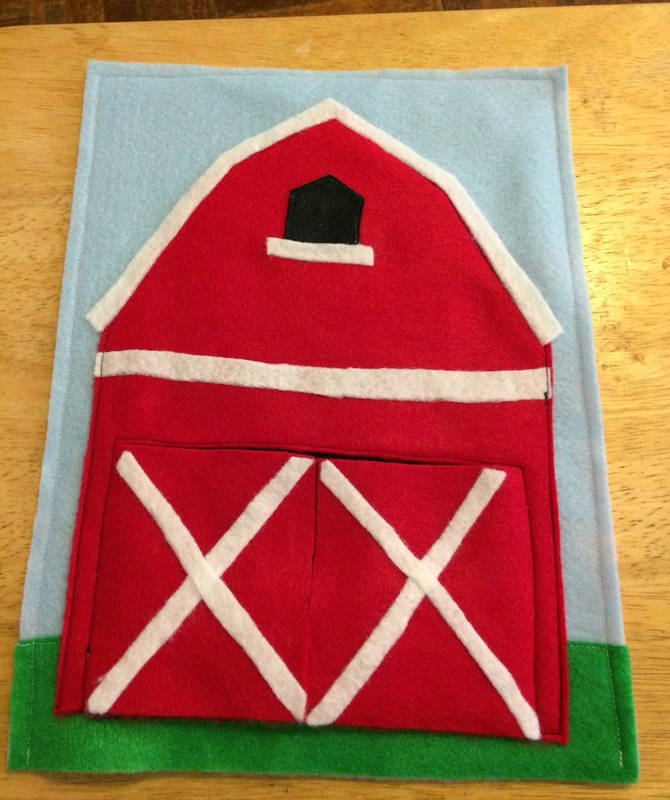 You do such a cute job at these felt projects. Wow those turned out great! This is so cute! I can see a whole book being made out of this being amazing! Looks like a lot of fun for kids. My daughter would love it. You are so gifted, I wish I could do crafts like this. 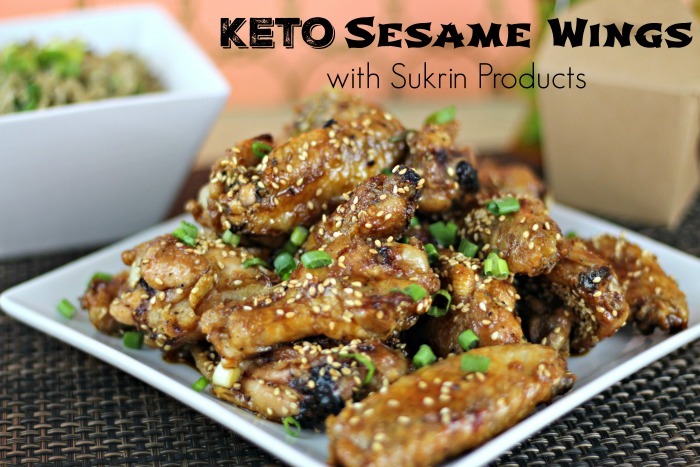 My daughter is an awesome artist and I think I am going to introduce her to trying this...Thank you so much for sharing this project with us all. Your Quiet Book is filled with amazing ideas! I'm trying to think how could I replicate it here. I'm not sure if I can get the fabric, so I'm considering other options but this is definitely something I want to do with our special education teachers. Wow! This is great! I can't even believe all the pictures you took with all the steps! Love this idea. I can't wait to do it for my nieces! Thanks! I love these - they are so neat! The barn one would be awesome for my youngest and my oldest would love the face one! You are so creative! Thanks for sharing - keep them coming! That is such a great book idea. It seems easy to make and great to present a story to children! I especially love the barn and animals. This is so cute! This Is Great My Girls Would Love Doing This! I love this tutorial thanks for sharing! My son would have loved this. I absolutely adore the idea of quiet books, they look so tactile and fun. I just wish I had the skills and patience to make one! Excellent tutorial, really well detailed.